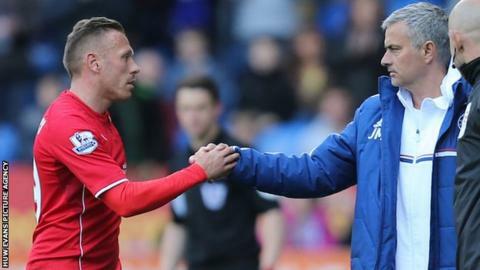 Former Wales assistant Raymond Verheijen says Craig Bellamy should focus on becoming a manager and spend the next two years or so learning the ropes. Following Cardiff City's relegation from the Premier League, the Dutchman said Bellamy, 34, should visit different countries and learn from a number of coaches but avoid taking a management job immediately. He said: "I would definitely recommend to refocus and prepare himself to become a manager." Bluebirds boss Ole Gunnar Solskjaer said the striker will take time to decide about his future after the team finished bottom of the league and as they prepare for life in the Championship. Verheijen, who was assistant to former Wales boss Gary Speed, added: "If you want to become a top manager then the last thing you should do is jump straight into management because then you make all the silly mistakes that all the other managers make when they are inexperienced. "My recommendation to him is to take at least two years, travel around the world. "Go to Spain, go to Germany, go to Holland, go to other countries; speak to and observe other managers and then in one or two years he might be ready to make his first move as a manager." Bellamy scored Cardiff's goal in the 2-1 home defeat on the final day of the season against Chelsea and applauded all corners of the stadium when he was substituted in the second half. He hugged Chelsea manager Jose Mourinho as he left the pitch on Sunday and fans now wait to hear what the 78-times capped former Wales international forward will do next. Verheijen said he believed Bellamy had the potential to become a successful manager and could play on for another year but "might as well retire and prepare himself to be a manager."